Pioneer Blockchain Investors ALERT: The MUST-OWN Company! It’s the Connecting Bridge Between the Immense Stock Market Investor Pool and the Tiny Cryptocurrency Sector! This chart starts with the first trading session of Bitcoin for the price of $0.05 and ends with September 11th, 2017. All in all, from $0.05, Bitcoin had reached over $4,700. For the early adopters, those who found out about Satoshi Nakamoto and his new peer-to-peer cash payment system via his white paper on the subject, this new technology offered a way to participate in something revolutionary, so core developers worked on the code while others mined it. Mining is the backbone of cryptocurrencies because it is miners who allow transactions between the community participants to be validated. As said, I learned about it in July of 2012, when it was $8.75. I bought it personally in November of 2012 and then more of it beginning January of 2013 for a boutique fund I ran. We began exiting at $119, all the way to $420 in late 2015 when I closed the fund because we had reached enormous success and I could afford to follow my passion to launch a financial newsletter, with no threshold or cost, in order to help strengthen the financial fortress of our subscribers. 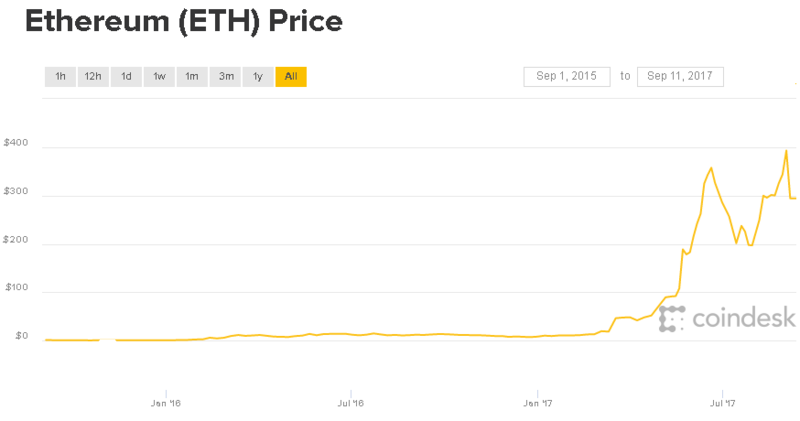 The newsletter I founded is Wealth Research Group, and in November of 2016 and February of 2017, when the price of Ethereum was $10.35 and $12.80, respectively, we alerted members of the free newsletter to consider owning this particular coin. From $12.80 in February of this year, it reached roughly $400 by September 1st, and as of September 11th, 2017, it trades for $294, a 2,300% gain from our suggestion alert. But for the vast majority of investors, cryptocurrencies and the blockchain remain an enigma, and they did not buy any because it is foreign to them and they fear the technological aspect of it all. On top of that, any specific coin — and there are over 800 of them out there — looks to be promising, so investors can’t pick among them and there’s always the risk you speculate on the wrong one. My goal was to find a way for tech-reluctant investors to get involved because it is the future of financial services. This means those who do not wish to buy cryptocurrencies on their own, store them in a wallet, and handle the technological aspect of it all can still get maximum exposure to blockchain technology. The world’s largest corporations and institutions are in a mad scramble to own the most innovative businesses, control the most profitable assets, and maneuver into the best angles of technology because they all realize this is the 3rd wave of the Internet and they all want to partner with the most talented groups. 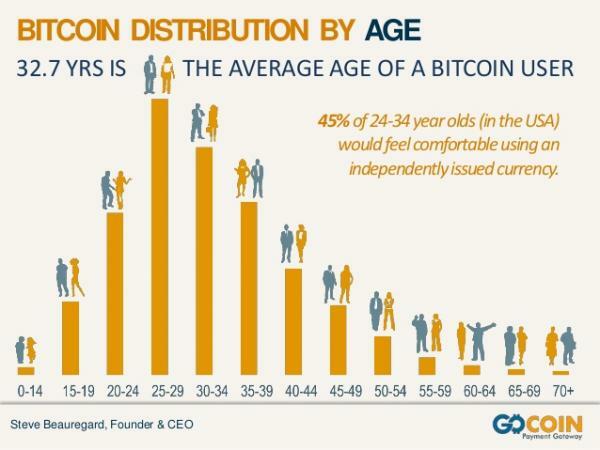 Remember, this industry began in 2009 with Satoshi and most likely a dozen other visionaries, and by 2012, it was probably a few hundred people. 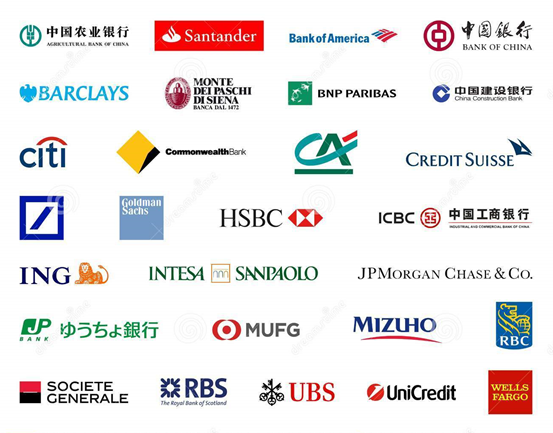 The world experts of this industry have 6-8 full years of cryptocurrency real life experience, while billions of other people have none. For these multibillion-dollar businesses that practically rule our world to not get left behind, they must seek out the crypto gurus and partner with them, because they can unlock the most potential profits and become the new Microsoft, Cisco, Intel, and Apple of the world. As I see it, we are on the cusp of entering a phase similar to the ‘90s, where ordinary investors made millions by investing early with companies that became the dominators of the Web, and a new wave of companies are about to reap the rewards from the explosion of blockchain technology. The only company Wealth Research Group has been able to fully vet and conduct thorough due diligence on, which has no holes for us to poke at, is Hive Technologies (TSX-V: HIVE & OTC: PRELF). Our Recommendation: Consider owning shares of HIVE Technologies (TSX-V: HIVE & OTC: PRELF) before the investment community realizes it’s the perfect vehicle for stock market investors to achieve optimal leverage to blockchain profit potential, because by that time, the price could be much higher than today’s. HIVE Technologies (TSX-V: HIVE) can be compared to Apple’s business strategy. Steve Jobs saw the music industry, a proven, global, sustainable profit center that begged for a better delivery system in order to reach many more millions of people who wouldn’t buy a Discman, so he came up with the iPod. Then he did the same thing with cellular phones and computers. The idea is to take an industry in which the current experience of delivering the product is insufficient for a great number of people and create a funnel by which they can not only participate, but enjoy their new product. HIVE Technologies is emulating Steve Jobs’ genius approach by opening up the cryptocurrency and blockchain world to the trillions of dollars in investor funds sitting on the sidelines because they don’t want to own unregulated, newly-formed cryptocurrencies, but they understand the significant growth potential of blockchain technology itself. What the people behind HIVE do is combine the decades of stock market experience of the Fiore Group, which owns many successful global businesses and has deep connections with titans of industry, institutional money, regulatory officials, and a wide net of management professionals who can build the first billion-dollar blockchain company. 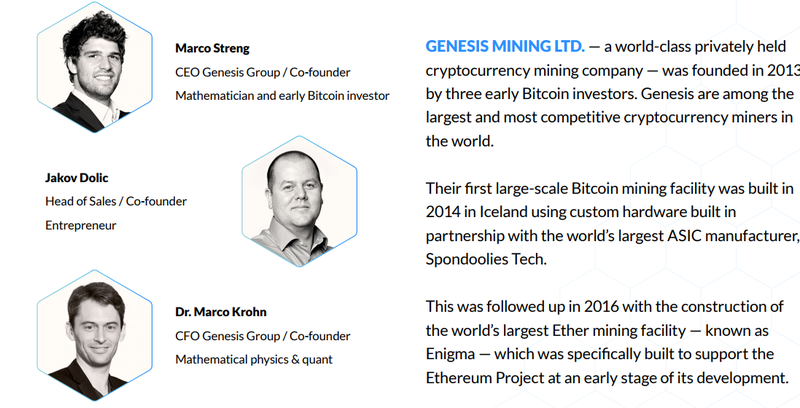 They wisely partnered with the largest cryptocurrency mining company in the world: Genesis Mining. The partnership is simple: Genesis Mining, which is a privately-held business with infrastructure and mining facilities spanning the globe, will sell mining centers to HIVE, provide them with expertise, data, operational know-how, and top-of-the-line technology to mine the most profitable cryptocurrencies, and HIVE would potentially use the profits from mining to cover the operational costs and make additional acquisitions to consolidate the market and become the No. 1 dominator. On top of this, HIVE will, according to its vision and business model, HOARD A STRATEGIC AMOUNT OF COINS TO LEVERAGE THE PRICE APPRECIATION. ⦁ Is acquiring one facility purchased from Genesis Mining, with the option to purchase more. ⦁ Plans to generate profit from mining the most profitable coin using state-of-the-art computing power and algorithms. ⦁ Next, it intends to allocate profits to cover all operational costs and grow the business rapidly by reinvesting it to consolidate competition and rule the blockchain industry. ⦁ Lastly, it looks to HOARD a strategic quantity of the mined coins for maximum leverage to rising prices.The brains behind Genesis are 3 of Bitcoin’s earliest adopters. You might have seen Marco Streng on numerous interviews and lectures, as he is considered the smartest man in blockchain technology worldwide. 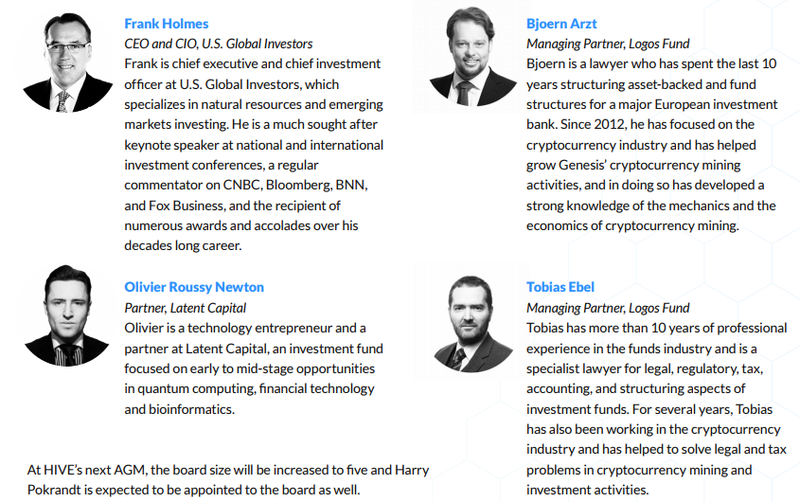 These 3 are the operational experts who will navigate the technological aspect of HIVE and propel the growth engine towards the ultimate use of shareholders’ funds. Now, the management team has fund manager superstar Frank Holmes, who is a multimillionaire and one of the seed investors in Goldcorp, one of the world’s biggest gold miners, so he knows exactly how to build a business into a monster and over-deliver for shareholders. This company might be the biggest winner of my career as a newsletter writer, and it is the only legitimate publicly-traded blockchain company. In my numerous conversations and face-to-face meetings with Fiore Management and Mr. Frank Holmes, along with the company’s CEO, Harry Pokrandt, I have the impression that they know they’re onto something unique and their timing is perfect. 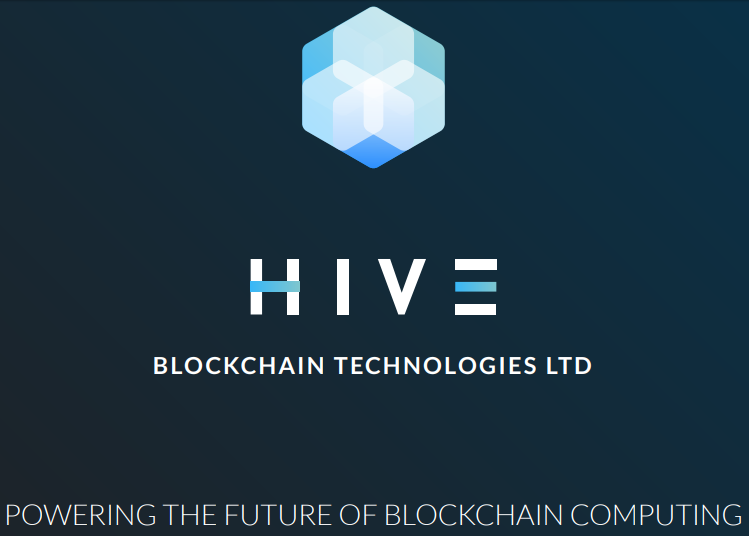 This is the only blockchain stock I plan to suggest – HIVE Technologies (TSX-V: HIVE & OTC: PRELF) is the MUST-OWN blockchain company, as I see it. For now, we are putting a firm maximum buy-up price of CAD$1.00. Don’t chase prices, let the opportunity come to you. Never base any decision off of our advertorials. Wealth Research Group stock profiles are intended to be stock ideas, NOT recommendations. The ideas we present are high risk and you can lose your entire investment, we are not stock pickers, market timers, investment advisers, and you should not base any investment decision off our website, emails, videos, or anything we publish. Please do your own research before investing. It is crucial that you at least look at current SEC filings and read the latest press releases. Information contained in this profile was extracted from current documents filed with the SEC, the company web site and other publicly available sources deemed reliable. Never base any investment decision from information contained in our website or emails or any or our publications. Our report is not intended to be, nor should it be construed as an offer to buy or sell, or a solicitation of an offer to buy or sell securities, or as a recommendation to purchase anything. This publication may provide the addresses or contain hyperlinks to websites. Wealth Research Group LLC has been compensated two hundred and fifty thousand dollars Canadian for a three year marketing agreement paid for directly by the company. We have also received additional payments in the same amount for Portfolio Wealth Global LLC, Future Money Trends LLC, and Gold Standard Media LLC. All of which are owned and operated by Future Money Trends LLC. Please use our site as a place to get ideas. Enjoy our videos and news analysis, but never make an investment decision off of anything we say. DAMN STRAIGHT: Next Crisis Will Chill Your BONES! Silver Surging: Price Gains Unleashed!